E.J. 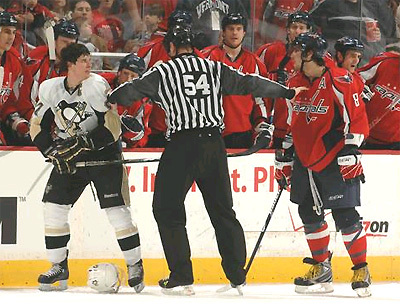 Hradek of ESPN brought to my attention the Sidney Crosby and Alexander Ovechkin debate. Who is the better player? Sidney Crosby and Alexander Ovechkin lineup on the ice next to each other. Hradek was asked who he thought was better between the two superstars. He believes that Ovechkin is the more dynamic player but thinks that Crosby is the more complete player. Both players bring their own style to the game but if Hradek was building a team from scratch he says that he would take Crosby. Over the years they have developed a competitive rivalry. It was a rivalry that they did not really develop on their own. They have been constantly compared to each other, especially when they both entered the league as rookies together. 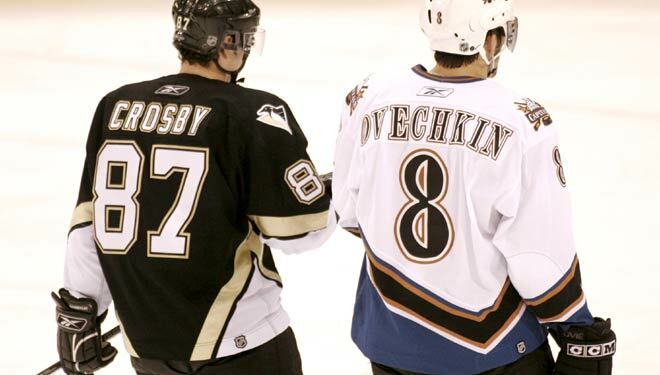 Ovechkin was drafted a year before Crosby but due to the lockout they played their rookie year during the same season. The Calder cup went to Ovechkin that year. When the two talk about their rivalry they do not believe it is a hate rivalry but a competitive one. “I respect him like a player, like a person, but when I step on the ice, I respect only my teammates,” a jovial Ovechkin said at the team’s hotel in Pittsburgh. “Off the ice, I can shake hands and say hi like normal people, but on the ice, you don’t have friends. They respect each other, but this is just what happens when you play a physical sport and compete against the same players throughout the season. From a fans perspective they are very different. Crosby usually tries to keep to himself while on the road. He avoids huge group of fans but that does not mean he won’t sign autographs. Crosby is willing to sign as long as it does not affect his teammates’ routines. Ovechkin is a little more outgoing. He has learned the English language pretty fast and does not shy away from meeting fans. At this point I would say Ovechkin probably has more fans. He is very charismatic and can finish on highlight reel plays. Not that Crosby cannot, he just does not have that same presence that stands out like Ovechkin. However, I think that Crosby is the better player. He is always thinking outside of the box, plays a very good two way game, great skater, good hands, good leader, and is creative in tight situations. Ovechkin on the other hand makes the ESPN highlight moves that fans tend to notice more. He is a force out there on the ice, he is a very skilled power forward and posses many of the same qualities that Crosby does. The main difference between the two superstars is that Crosby plays better at both ends of the rink. This makes Crosby the complete player and giving him an edge over Ovechkin. I would take Crosby over Ovechkin any day, but that is just my opinion. When it comes to the debate they have a pretty even amount of supporters. Where do you stand? Well that is for you to decide. Should NHL Stars Play In The 2014 Olympics?